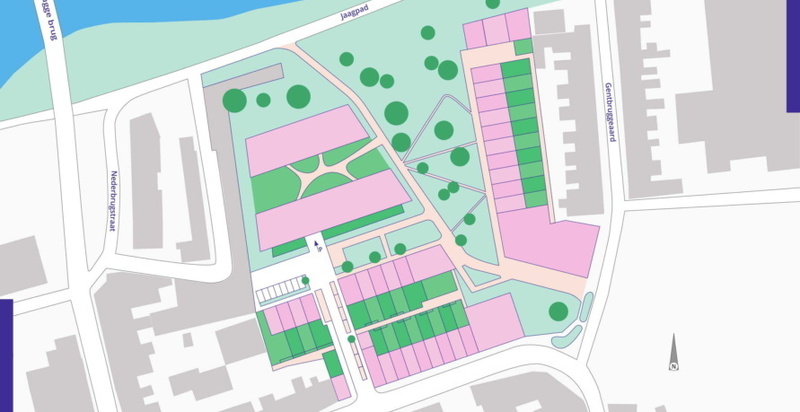 In October 2018 the construction of a brand-new district has started on the former Sidaplex site in Gentbrugge. This district is called RUTE. Here you can experience clean living in a vibrant, centrally located part of Ghent. More than one hundred homes will be built in this young and lively neighbourhood close to the city centre. With around 6,000 m² of public green zone and the nature of the Gentbrugse Meersen within walking distance, RUTE is also a very environment-conscious neighbourhood. Revive launched the Rute project on 5 May 2018. The first thing you'll notice is the nice mix of houses and apartments. The architects (CAAN and BLAF) want to offer the best of both worlds by letting ambitious architecture go hand in hand with the sustainable character we aim to give to this neighbourhood. The name of the site - RUTE - is a reference to Sidaplax, which, until 2011, produced the window film for envelopes - the so-called 'ruitjes'. When the firm relocated, a beautiful area became available to create a dynamic and especially sustainable residential district. The name itself honours the history of the site. There is a wide variety of apartments and houses available in Rute, from 1 to 4 bedrooms. Whether you love the view of the Scheldt river or of the local park, you can be sure to find a home that lives up to your needs and expectations. RUTE will be located in Gentbrugge, a district already alive with things to do. The site borders a scenic towpath along the water, boasts its own beautiful 6,000 m² park and is within walking distance to a nature reserve and various parks. A fresh market, retail shops and lively cafés and restaurants nearby make Rute the ideal place to live. Interested in living or investing here? We have a lot more to tell you about our project in Gentbrugge. Feel free to call or email us for an appointment.